Otex Ear Drops: These are dual action ear drops that are clinically proven to get rid of hardened ear wax which is tough to remove. 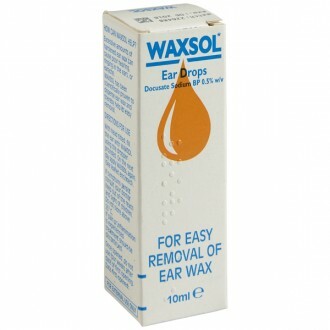 The active ingredient is urea hydrogen peroxide and glycerol which works to break down ear wax by softening it which ensures the wax falls from the ear easily. 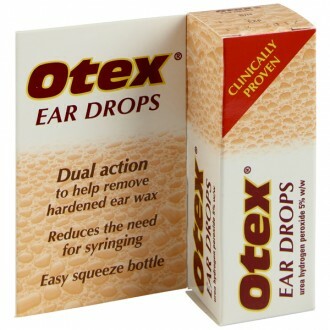 Otex Ear Drops are used to help soften earwax. It contains the active ingredient urea hydrogen peroxide. This ingredient works by releasing oxygen, which breaks up hardened earwax. Otex’s unique formula also has some antiseptic properties. Earwax is a natural secretion of the ear. Its purpose is to provide a protective layer on the eardrum and in the ear. Sometimes too much wax is produced, which can result in hearing difficulties. For some, it may even cause pain. A hard plug of earwax can be effectively softened using Otex Ear Drops. Alternatively, earwax can also be removed by your doctor or practice nurse, where the ear is flushed out with warm water (syringing). If there is large amounts of earwax or if the earwax is excessively hard, it may require softening prior to syringing and Otex can be used for this purpose. Otex Ear Drops work to break down hardened earwax into pieces that can then be excreted naturally by the ear. Otex solution comes in an 8ml easy squeeze bottle that contains more than enough solution for one treatment. While tilting the head, gently instil up to 5 drops into the ear. Reapply once or twice a day, if required, for about 3 to 4 days while symptoms clear. After use, clean your hands. Ensure you also replace the cap and put the bottle back to its carton. Dispose of the bottle and its' contents after 4 weeks of opening. Patients might experience a gentle, short-term effervescence in the ear. If pain or irritation occurs, discontinue use. Usage of this medication might intensify excessive ear wax painful symptoms such as dizziness, some loss of hearing and tinnitus. Though not often, an unpleasant taste has also been reported. Discontinue treatment and consult your doctor if you experience any of the unwanted effects or if symptoms worsen or persist. Avoid using this medication if you suffer from dizziness, or if your eardrum is or has been injured or if you are using a hearing aid or other ear drops in the ear or if there is pain, discharge, swelling, or infection in your ear. Use this medication only under close supervision of your pharmacist or doctor, if you have history of ear problems. You should avoid using these ear drops if you have had your ear syringed in the previous 2 to 3 days, or if you have attempted to remove ear wax using cotton buds, fingernails, or other instruments since applying the drops into the ear after such can aggravate the pain. If you are not sure whether to use the drops, consult your pharmacist,nurse or doctor before use. Discontinue treatment and consult your doctor if pain or irritation occurs during use, or if symptoms persist. Do not contact the eyes with these drops. Otex can be used by adults, children and the elderly and is safe to use during pregnancy or breastfeeding. However, pregnant women should always seek medical advice before starting any new treatment. Also, as a general rule, it is advisable to be cautious when using any medicine during breastfeeding, unless it has been prescribed by a doctor. Can Otex be used if you have tinnitus? If you suffer from any other ear related problem you should not use Otex unless your doctor has advised you to do so. Is Otex safe for children? It is rare for young children to suffer from impacted earwax, so it is a good idea to seek advice from a doctor before attempting treatment. Should I use Otex before having my ears syringed? Otex can make the process of syringing much easier. In some cases, it can even negate the need for syringing altogether. You should not need to use any kind of earwax removal drops soon after syringing as it generally requires months for the wax to build up. If you suspect that an earwax problem has recurred sooner, you should seek medical advice. Can you use Otex if you use a hearing aid? You should not use Otex if you use a hearing aid. You should seek professional advice if you have a history of any other ear related issue. Can Otex Ear Drops be used with grommets? No, Otex should only be used to treat impacted earwax where the eardrum is intact. Grommets pass through the eardrum and may inadvertently allow an eardrop, like Otex, to penetrate the middle ear. Have Otex Ear Drops been tested on animals? No. Otex has only been tested on human patients undergoing clinical trials for earwax problems. Do Otex Ear Drops contain any animal derivatives? None of the ingredients in Otex Ear Drops are of animal origin. Do Otex Ear Drops contain any nut derivatives? None of the ingredients in Otex Ear Drops contain any nut derivative. Otex ear drops contain the active ingredients; urea hydrogen peroxide, which helps to soften ear wax.